« Service Cancelled due to weather conditions. Please join us for today’s service led by Rev. Paul Dodenhoff. 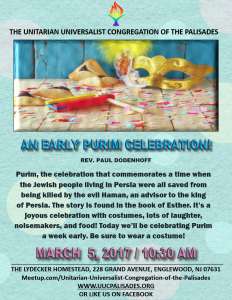 Purim, the celebration that commemorates a time when the Jewish people living in Persia were all saved from being killed by the evil Haman, an advisor to the king of Persia. The story is found in the book of Esther. It’s a joyous celebration with costumes, lots of laughter, noisemakers, and food! 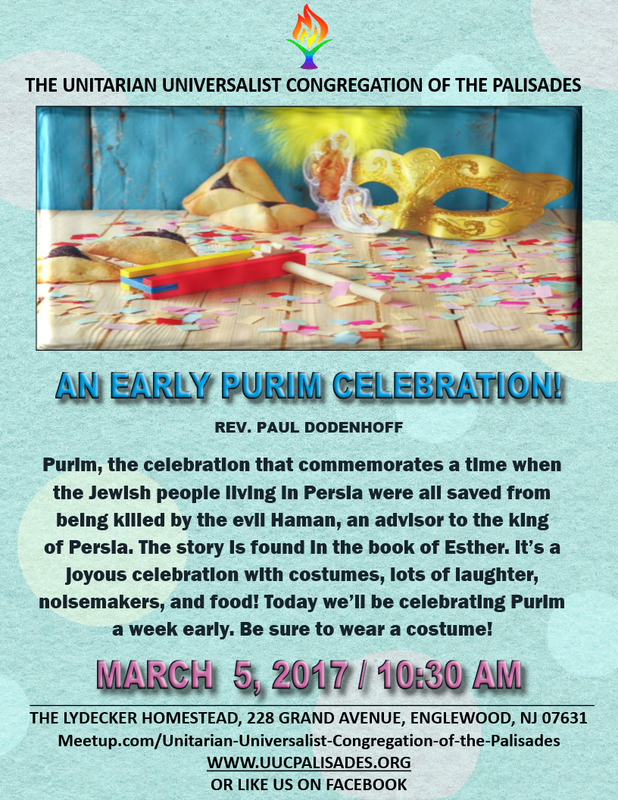 Today we’ll be celebrating Purim a week early since Rev. Dodenhoff will be on vacation starting next week and he loves hamentashen! (You’ll have to come to find out what that is if you don’t know!) And be sure to wear a costume!